File Formats: We strongly prefer artwork to be supplied in PDF format. Maximum upload file size is 10MB. Large artwork files can be sent using wetransfer. Design Separation: Each design should be either a separate file. A 2 page PDF should be supplied if printing is front and back of flag. Printed hand waving flags make great walking advertisements. Waved and paraded on a high street, a printed flag places your brand right in public view, spreading your image or promotional message to a wide audience in and around your venue. Our flags are manufactured with care and attention to detail, produced using the best printing and automated finishing techniques available to give you safe, quality flags which are value for money. Every flag we produce is child safe and has been certified to EN71Toy Safety standards. Team our biodegradable flag stick with a recycled paper pennant to create a 100% biodegradable hand waving flag, which meets European Communities’ Directive EN 13432. Hand flags are printed using either digital or lithographic printing methods, and can be printed in Full Colour CMYK to both sides,whether matching or alternative designs. Made from ethically sourced FSC® paper, every paper flag we produce can be traced through our chain of custody. 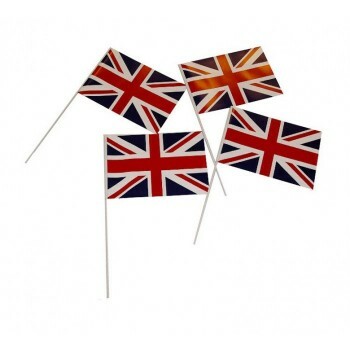 Our flag sticks measure 325mm, with the plastic option available in 6 different colours.